Although diamond engagement rings have been the most typical engagement ring for many years, another style whose popularity continues to rise is engagement rings with gemstones. With so many colours to choose from, from the palest hints of colour to the richest and darkest hues, there really is a gem for everyone. Sapphires are one of the oldest known coloured gemstones. They are also one of the most ideal coloured gemstones for engagement rings. They have a high hardness giving confidence that your precious gem is going to stand up well when worn every day. They are also available in a wide spectrum of colours from soft pastels to greens, yellows, pinks and the darkest of blues. 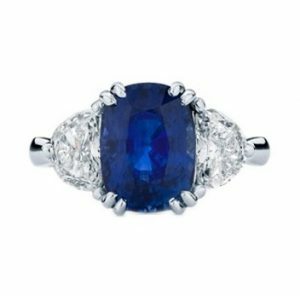 The most requested type of Sapphire is the Ceylon Blue Sapphire, this is not surprising when you consider the most famous Sapphire ring is the Royal Sapphire engagement ring worn by Princess Diana and now worn by Princess Kate. Also on the rise is the popularity of pink and yellow sapphire engagement rings. Pink sapphires, in particular, are a wonderful alternative to the rare and expensive pink diamond, they come in all shades. One of our favourite combinations is soft pink sapphires set into rose gold, we think this is a match made in heaven! Another appealing reason to purchase a coloured gemstone is their price tag. Choosing a sapphire as your centre stone often means you can afford a larger gem for your money. If you have your heart set on a statement centre stone that will give that Wow! factor to your ring then a sapphire is a perfect choice. Choosing a sapphire does not mean you have to forgo diamonds altogether, in fact, we think diamonds set into the shoulders or halo of your ring are the perfect way to complement and accentuate your sapphire. Here is a selection of some of our favourite sapphire rings featuring diamonds. The ‘Radiance’ a beautiful three-stone ring featuring a radiant yellow sapphire and two side diamonds. The ‘Belle’ featuring a stunning soft pink sapphire surrounded by a halo of white diamonds. The ‘Azure’, a striking design featuring a soft blue pear shaped Sapphire complemented by two rows of baguette diamonds. The ‘Soiree’, an elegant three stone featuring a dark blue Australian sapphire. A beautiful Lilac sapphire set with contrasting rose gold claws and complemented with a diamond halo and diamond set shoulders.